The vacation rental policies for Southern Comfort Cabin Rentals (SCCR) are included in this FAQ. Our policies are subject to change without notice. How do I search for vacation rentals and view rates? You can search for cabin rentals by entering your travel dates in the Search Rentals field on any page of our website, or by clicking the search icon in the header on a mobile device. Search for available homes based on several criteria, including number of bedrooms and guest count. Once you check availability, you’ll see individual properties that meet your criteria with nightly rates. Results can be refined using filters. When you’re ready, you can make a reservation online or over the phone. Call or email our team during business hours for help selecting the perfect home, to request additional services, or for questions. Nightly rates are subject to change until a reservation is made, and do not include taxes, cleaning fees, the Damage Protection Fee, or any additional fees or requested services. We offer a variety of standard discounts as well as seasonal and limited-time specials. Visit our Specials & Discounts page for the latest deals on cabin rentals. Specials, promotions, or discounts must be requested at the time of booking and will not be applied after the reservation is confirmed or paid in full. We offer gift certificates perfect for any occasion. They make a thoughtful and unique gift for friends, family, or business associates. You may specify a specific dollar amount on any gift certificate. To order, please call or email our team. Are there age restrictions on renting a cabin? We only accept reservations from adults age 25 and older. The reservation must be made in the name of a guest who will occupy the cabin rental and be responsible for the rental group and any visitors for the entire stay. Guests will be asked for a valid photo ID/driver’s license number and proof of age at the time of check-in. How and when do I pay for my reservation? A $200 down payment made by credit card is required to secure your reservation and will be credited towards the total balance. Reservations must be paid in full 30 days prior to check-in for standard properties and 60 days prior to check-in for Private Reserve and Lake Blue Ridge properties. We accept Visa, Mastercard, American Express, Discover Card, and debit cards. Reservation payments may also be made using e-checks. All checks must be processed and accepted by our bank by the balance due date specified on your reservation. Please reference the reservation Transaction ID in the memo section of your check when submitting payment. Our system automatically charges the final balance within 30 days of check-in and within 60 days of check-in for Private Reserve and Lake Blue Ridge properties to the credit card on file that was used to make your reservation down payment. If the balance is not paid by this deadline, your reservation may be canceled and payments forfeited. To make a payment by phone, call 866.4CABINS. Submitting a reservation online or over the phone indicates that the guest agrees to the policies, rules, and safety guidelines outlined in this FAQ. Upon submission, the guest authorizes “Sharp Real Estate Services, LLC DBA Southern Comfort Cabin Rentals” to bill charges relating to the rental and use of the cabin. What will my credit card on file be charged for? Can I change cards? The primary credit card on file used to make your $200 reservation down payment will automatically be charged for the final balance within 30 days of check-in for standard properties and within 60 days of check-in for Private Reserve and Lake Blue Ridge properties unless other arrangements have been made. Your credit card might also be charged for authorized guest requests and additional services. The guest accepts and understands that all liability and costs associated with damage due to guest negligence, misuse of property, or missing items is the responsibility of the guest. All credit card sales are final. To update your payment method, call 866.4CABINS. In the event of a payment discrepancy involving a guest or vendor payment, SCCR will seek rightful payment or collection. If disputes are transferred to a collection team or attorney, the guest will become responsible for all charges proved to be their responsibility, including the cost of collection and legal services. When will I receive my reservation confirmation? You should receive a reservation confirmation email from our system within an hour of making a reservation. Carefully review the confirmation email to verify your information including travel dates, rates, mailing address, contact phone number, contact email, or any special requests. Please report any errors within 24 hours of receiving your confirmation email. When do I sign the Guest Rental Agreement (GRA)? Shortly after you make your reservation, you will receive a confirmation email with a link to sign the GRA online. With our 48-Hour Assurance policy, you can make changes to your reservation for free up to 48 hours after booking. In addition, if you decide to cancel within 48 hours of making a reservation, no charges will be applied. After 48 hours, you can make changes up to 30 days prior to check-in for standard properties and 60 days prior to check-in for Private Reserve and Lake Blue Ridge properties for a reservation change fee. You may cancel your reservation up to 48 hours after securing your reservation and receive a full refund. After the 48 hour grace period has ended, the $200 down payment is non- refundable. All cancellations must be confirmed in writing and are not complete until you receive a confirmation email from our team. Cancellations made within 30 days of check-in for standard properties and within 60 days of check-in for Private Reserve and Lake Blue Ridge properties are nonrefundable, and all payments will be forfeited. Refunds will be processed to the credit card on file that was used to make your reservation down payment. Cash refunds are not available. Refunds or rate adjustments are not issued for inconveniences, failure of appliances and equipment, late arrivals/early departures, construction noise, acts of nature, inclement weather, or circumstances beyond our control. If applicable, refunds will require a reservation change fee. Any credit issued will be for the original amount collected. What happens if the cabin I reserved becomes unavailable? We make every effort to ensure the cabin you reserved is the one you enjoy during your stay. If the home you rented becomes unavailable due to circumstances beyond our control, SCCR reserves the right to relocate you to a similar property, reschedule your stay, or issue a credit for a future visit. You will be refunded any difference in cost or will be responsible for any additional costs above the collected balance. If there are not any comparable options, you will receive a full refund. We highly recommend you purchase travel insurance if you feel that there is a chance your travel plans could be interrupted for any reason. Guests may elect to purchase a travel insurance policy from CSA Travel Protection before their final balance is paid. Travel insurance may cover any fees or money lost based upon the coverage provided. Once travel insurance has been elected, a 10-day Free Look period will apply, and any cancellations of insurance must be made within the 10-day period. Learn more in the Travel Insurance Quick Reference Guide. Do you charge taxes on your cabin rentals? All vacation rental companies, hotels, lodges, and individuals are required to charge taxes on accommodations. Applicable state and local taxes will be added to the reservation nightly rate, cleaning fee, and other mandatory fees and charges. Optional services or pass-through charges collected on behalf of a vendor may be exempt. What is the cleaning fee for? When are the cabins cleaned? The cleaning fee varies by the size of the property and is charged to ensure your cabin is in the best condition upon your arrival. Each vacation rental is assigned a specific team for cleaning/housekeeping services and to replace missing items. Cabins are inspected within 10 days of check-in and after check-out. Linens and towels are not changed during your stay unless requested. Mid-stay cleaning is available upon request. Contact the SCCR office for details. What is the Damage Protection Fee for? Each reservation is charged a non-refundable $60 fee for a Damage Protection Waiver (DPW). The DPW is designed to protect you from charges up to $500 for accidental damages beyond normal wear and tear. If any damages surpass $500, additional charges will be applied to the credit card on file, and written documentation will be sent to the guest. If damages are determined to be caused by willful misconduct, misuse, or pets, the DPW will be voided on the grounds of intentional acts, gross negligence, or willful and wanton conduct by the guest, licensee of guests, or visitors. These occurrences will result in the guest being charged in full for any damages and fees. The DPW does not cover any additional fees or fines. All accidental damages must be reported to the SCCR office before departure to qualify for protection. What items do the cabins include? What should I bring? Our vacation rentals include linens and towels, plus a start-up supply of toilet paper, paper towels, trash bags, and bath soap. The housekeeping team will provide the proper amount of linens and start-up products for the number of guests in your group. Start-up supplies are not replenished during your stay. Every cabin has a fully equipped kitchen with everything you need to prepare and serve meals. First aid kits and fire extinguishers are available. Medicines such as ibuprofen are not provided. We suggest bringing personal items and groceries. If you require special appliances or equipment, please bring them or make arrangements with the SCCR team prior to your arrival. If you are staying more than 3 days or have a large group, we suggest bringing (or purchasing at a nearby store) hand soap, toilet paper, paper towels, trash bags, dish washing detergent, laundry detergent, coffee and coffee filters, condiments, and family entertainment items like DVDs, books, games, and toys. In the spring and summer, don’t forget sunscreen and insect repellent. In the fall and winter, we recommended bringing or purchasing firewood for outdoor use. Each home is privately owned, furnished, and equipped by the homeowner. We cannot make any changes to what was provided by the owner. Under no circumstances should furniture, bedding, gas logs, electronics, or items supplied with the rental property be rearranged, disconnected, transferred to another cabin, or removed from the property. Bath towels should not be removed from the property or used for rivers, creeks, lakes, ponds, or cleaning purposes. Stained, misused, or missing towels and linens will be replaced at the guest’s expense. In certain areas of each home, there may be locked areas used by the homeowner for personal storage or housekeeping supplies. These locations are not included in the rental. Tampering with locked areas or moving furnishings may result in a minimum fine of $100, depending on the circumstances. How do I get directions to my Blue Ridge mountain cabin rental? You will receive directions to your home when you check in at our office, or directions can be emailed to you once your reservation is paid in full. All directions originate from the SCCR office. What vehicle should I drive? Can I tow a trailer or RV to my cabin? You should not need four-wheel drive or a special vehicle during your vacation to Blue Ridge. However, depending on the weather, some cabins might require a four-wheel drive vehicle. If you will be arriving by motorcycle, sports car, or other low-sitting car, we recommend contacting the SCCR team prior to your trip. If you plan on towing a trailer or RV, please contact the SCCR team so we can advise if your cabin rental is accessible. ATVs are not permitted at any property. What should I do if inclement weather affects my reservation? Be sure to monitor weather and road conditions prior to arrival, especially during the winter. We strongly recommend purchasing travel insurance if you are concerned about possible interruption, cancellation, or delayed travel. Weather and road conditions can change rapidly, and roads may become or remain impassible for extended periods of time. You can contact the SCCR team to inquire about conditions with the understanding our team cannot predict or guarantee weather or road conditions. If you do not show, or choose to depart or check-out early, you will be voluntarily forfeiting your reservation. If you wish to reschedule your reservation due to extreme weather, you may reschedule within 72 hours of arrival. If you do not reschedule during this time, you will not be able to make changes to your reservation. Rescheduled reservations must fall within 30 days of your original arrival date. Guests who arrive during inclement weather, check in, and occupy the cabin will be proceeding at their own risk. We recommend making appropriate arrangements. Power outages may occur at any time for many different reasons. SCCR is not responsible for power outages caused by forces beyond our control. Guests must contact the SCCR team as soon as possible to inquire about extending a reservation, or if the guest must delay check-out for any reason. The current nightly rate will be added to the reservation for each additional night, and the guest must pay for any additional services. What are your office hours and location? SCCR is located in downtown Blue Ridge. Visit our Contact Us page for hours and a link for directions to our office. Our office may be closed on select holidays. If you are a guest currently staying in a cabin and need after-hours assistance, please use the 24/7 assistance number included in your reservation information. Check-in is 3 p.m. and check-out is 10 a.m. Upon check-in at the SCCR office, you will be asked to present a valid photo ID and complete a check-in form to verify the length of your stay, guests who will be occupying the home, account charges, and acceptance of keys (if applicable). We know your vacation is important, and every effort will be made to ensure your cabin rental is ready at check-in. Check-in time is not guaranteed, and no concessions, rate reductions, or refunds will be issued for postponed check-ins due to circumstances outside of our control. Check-out is strictly enforced. All check-out instructions must be completed prior to departure, or additional cleaning fees may apply. Hourly hold-overs will be charged $25 per hour until 3 p.m. After 3 p.m., the full nightly rate will apply. Can I request an early check-in/late check-out? Early check-in and late check-out may be requested in advance based on availability and requires an additional fee. Guests must contact the SCCR team as soon as possible to inquire about early check-in/late check-out, extending a reservation, or if check-out has been delayed for any reason. The current nightly rate will be added to the reservation for each additional night. When arranged in advance, after-hours check-in is available at the SCCR office upon request. Once the request is confirmed, you will be emailed instructions. Do you offer keyless entry? Most of our cabin rentals are equipped with keyless entry. Can I check in directly to my cabin? When arranged in advance, you may check in directly to your vacation rental. A fee is required, and you will be emailed instructions. When will I receive the door code or key to my cabin? If your cabin features keyless entry, you will be issued a door code at check-in. For your convenience, you will not be required to return to the SCCR office at check-out. If your cabin requires a key, you will be issued one set of keys at check-in. All keys must be returned to the SCCR office upon check-out unless otherwise arranged. Please keep the keys in a safe place as you will be responsible for any lost or stolen keys. If keys are not returned for any reason, the guest will be responsible for the cost of replacing keys or re-keying the property. SCCR uses a professional locksmith to re-key all exterior doors, and costs vary. Do you own the cabin rentals? Our homes, or “cabins,” are privately owned by individual homeowners, and SCCR manages the homes on their behalf. Visit our Property Management page or contact our team if you’d like to explore the benefits of vacation rental management for your Blue Ridge home. 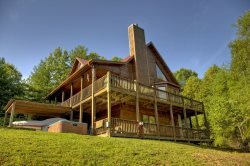 Our vacation homes are located about 10–30 minutes from the SCCR office and are spread throughout Fannin, Union, and Gilmer counties. Most homes are located on gravel roads in the mountains. When searching for a cabin rental, you can sort by popular areas or specific locations. Are the cabins located close to one another? Some of our homes are situated nearby or in the general vicinity of other homes. We also have several groups of cabins that are within walking distance from each other. Please contact our reservations team for additional details. Is the cabin I reserved the one I’ll stay in? You will check in to the specific property you reserved, unless other arrangements have been made. We have made every effort to ensure individual cabin listings are accurate, but the possibility of errors and omissions may exist. The SCCR team will be happy to confirm cabin amenities or answer any questions prior to check-in. Do the cabins have hot tubs or pools? Each individual cabin listing will indicate if there is a hot tub or pool. All guests must observe any posted safety information for hot tubs and pools. Hot tubs are drained and refilled or balanced before check-in. There is a $75 convenience charge if a guest requests that the hot tub is drained, cleaned, refilled, or balanced during their stay. For hot tubs, the cover must be in place and latched when not in use. A capful of shock enhancer should be added after each use to ensure proper sanitation. Children under age 18 are not permitted near or in hot tubs without constant adult supervision. The temperature should never be elevated above 104°F. Pregnant women, individuals with injuries or medical conditions, and children should not use hot tubs without first consulting a doctor. Extreme care should be taken to ensure hair and clothing does not become entangled in drains. Pets are never allowed in hot tubs. Do the cabins have game rooms? Some cabins offer game rooms or areas with table tennis, pool, shuffleboard, arcade machines, darts, and more. Check your cabin’s individual listing or contact the SCCR team to inquire if your home has any game room amenities. Game rooms are designed for everyone’s enjoyment. Please respect the condition of these amenities and do not roughhouse around them. Children should always be monitored while using game room amenities. Damages due to misuse will result in repair or replacement at the guest’s expense. Do the cabins have grills? Most cabins feature an outdoor natural gas, propane gas, or charcoal cooking grill. Check your cabin’s individual listing to determine availability. Gas grills should be turned off after each use, and never use charcoal in a gas grill. Charcoal grills should be cleaned after each use. Do not move the grill. Do the cabins have fireplaces or firepits? Is firewood provided? Each individual cabin listing will indicate if there is a fireplace or firepit. When using a fireplace or firepit, always make sure the fire is completely extinguished after each use. For homes with wood-burning fireplaces, always check that the flue is open, and start with a small fire to build up to the desired size. Never overload wood-burning fireplaces or firepits. Firewood is provided for indoor wood-burning fireplaces. We recommend bringing a small Duraflame log or other fire-starting log. Gas accelerants are not permitted. Firewood is not provided for firepits or outdoor fireplaces and can be purchased at local gas stations or grocery stores. Cutting wood, trees, or plants surrounding your cabin rental is not permitted. Gas fireplaces may be used but are not serviced during the summer (Memorial Day weekend through Labor Day weekend). Never rearrange or tamper with gas logs. This is a major safety issue and could be hazardous to your health. Tampering with gas logs will result in additional fees to pay for repairs by a gas company. Do any cabins have boats or docks? Our waterfront vacation rentals may offer boats and/or private docks for guest use. Check the individual cabin listing or contact the SCCR team to see if your home is equipped with a boat or dock. Do the cabins have Wi-Fi? Most homes are equipped with Wi-Fi. You can check your cabin’s individual listing to see if it is included. Homes equipped with telephone-based internet may experience service interruptions outside of SCCR’s control. SCCR cannot guarantee internet speed or proper operation. By connecting to the cabin’s Wi-Fi network, the guest agrees not to use this internet service for anything unlawful or inappropriate. Do the cabins have streaming services, cable TV, or satellite? Our homes have different subscription packages for streaming services, cable, or satellite. We cannot guarantee any programs, events, or subscription levels. Guests are not permitted to use Pay-Per-View services or to unlock any blocked channels. What electronics are in the cabin? For a list of electronics, check your cabin’s individual listing or contact the SCCR team. Some cabins are equipped with sophisticated electronics and stereo equipment, and under no circumstances are guests allowed to disconnect or reconnect any electronics. Do not tamper with wiring or modify configurations to add a game system or other device. Tampering with electronics may result in service fees to reconfigure electronics and wiring. Are any of the cabins for sale? Our cabin rentals are owned by individual homeowners who may have listed their home for sale. You can contact our team for more information on purchasing a home or view Turnkey Cabins for Sale online. Real estate brokers have been informed not to show cabins listed for sale while guests are staying in the home. If a real estate agent, under their own free will, shows up unannounced to show a property to potential buyers, please instruct them to call the SCCR office immediately. As a courtesy, you may be contacted during your vacation for permission if an agent wishes to visit the premises to show a cabin. What are your safety rules and policies? Upon checking in to your cabin, look around the home and become familiar with exits, fire extinguishers, amenities, furniture placement, and any potential dangers. Please use common sense and follow all posted safety rules during your vacation. Some homes are located near rivers, creeks, lakes, or ponds, and some may have access to boats or docks. Inherent risks exist with properties located near bodies of water. Water recreational activities as well as boat and dock usage are at your own risk. SCCR and the homeowner are not liable for damages arising from personal injury, property damage, or death sustained in or around the property, roads, docks, or bodies of water. The North Georgia mountains are home to a diverse group of wildlife, insects, and plants. Due to this environment, certain conditions may exist in and around the rental property that are beyond SCCR’s control including but not limited to pests and unexpected animal encounters. Avoid approaching, feeding, or harassing wildlife of any kind. When enjoying time outdoors, wear protective clothing, sunscreen with an SPF of 30 or more, and an EPA-registered insect repellant. SCCR and the homeowner are not liable for theft, personal injuries, damage, costs, or any expense whatsoever arising from or related to any claim or litigation which may arise out of or in connection with guest use of the rental property. Failure to follow SCCR’s policies, rules, and safety guidelines could result in eviction without refund. Intentional property damage, personal injury to guests or others, a breach of the peace, a nuisance to others, or a violation of any criminal law or local code shall be grounds for immediate eviction without refund. All policies and rules are in accordance with the laws of the State of Georgia and Fannin County. Any action relating to these policies shall be instituted and prosecuted only in the Fannin County Superior Court, Fannin County, Georgia. What are the rules for boats and docks? Are swimming and fishing allowed? Boat and dock usage is at your own risk. Dock center walkways must be kept clear at all times. SCCR and the homeowner are not responsible for any injuries that might occur. You may swim at your own risk. Guests should always wear a life jacket when near or in the water. Children age 10 and under must wear a life jacket at all times even when on docks or walkways. Children swimming and on docks must be supervised by a responsible adult at all times. No lifeguards are on duty. Stay away from moving boats, and use ladders to get back onto docks. Do not place hands, feet, or any part of the body under dock platforms as there are sharp objects. Fishing is permitted on docks. Please use caution when casting around boats and fuel lines. For the safety of other guests, keep center walkways free of fishing poles, chairs, coolers, tackle boxes, and other fishing equipment. Smoking, grills, and open fires are prohibited on docks as gasoline vapors and accidental leaks and spills may be present. Please properly dispose of cigarette ashes and butts before accessing docks, and do not throw them into the water. If you have a grill mounted on your boat, it cannot be used at a dock and may only be used over open water. Fireworks are prohibited on docks and cabin property. If using a boat during your vacation, it is the responsibility of the guest to know Georgia boating laws and abide by them. When using a boat, personal items should be properly stored and secured. Boats must be covered and locked when not in use. Do not allow waste, fuel, oil, or chemicals to spill into the water. Any cleaning products used must be biodegradable. Ropes, hoses, and electrical cords must be coiled on racks or otherwise routed so as not to obstruct walkways. Dock boxes are not permitted. Every effort has been made to secure docks; however, SCCR is not responsible for any lost, missing, damaged, or stolen items or any items lost due to wind, water, or waves. Trash receptacles at docks are for your convenience and intended for small items only. Do not leave trash beside the receptacles as it will attract unwanted pests. If you have large amounts of trash, please dispose of it in the outdoor trash cans near your cabin. How many guests can stay in the cabin? Are visitors allowed? Maximum occupancy is indicated on each individual cabin listing and included in your reservation confirmation. If the number of guests exceeds maximum occupancy, additional fees will apply. You will be asked to register occupants by listing the first and last names of each adult and child when making a reservation. Please contact the SCCR team to add or remove registered guests. A fee of $50 per guest per night will be charged if additional guests occupy your cabin without confirmed registration. Visitors are permitted in the cabin until 10 p.m. and may not stay overnight unless registered. Parties and special events are prohibited without prior written authorization from SCCR. If you host a party or special event without authorization, you will be charged a fee or immediately evicted. Do you offer pet-friendly cabins? We have many vacation rentals that allow up to two dogs. They are designated on our website as “Pets Allowed.” This option is also stated on each individual listing and requires a $150 non-refundable pet fee when making a reservation. Size/weight restrictions may apply based on the property, and an additional $50 fee is required to bring a second dog. Guests are responsible for any damage cause by pets, and waste must be bagged and placed in outdoor trash cans. Additional fees will apply if waste is not properly discarded. If an unauthorized pet is discovered in any cabin, a $200 fine will be charged. An additional cleaning fee up to $300 will be added if a pet is found in a home not designated as pet friendly. Under no circumstances should a dog be left in a cabin unattended (unless they are crated) or permitted in a hot tub. Quiet time is 10 p.m. to 8 a.m. Sound can travel a long way in the North Georgia mountains and may disturb unseen neighbors. During quiet time, please be courteous and keep noise to a minimum inside your cabin and in outside areas such as outdoor fireplaces, firepits, hot tubs, and docks. You will be allowed one warning before being reported to local authorities. To ensure the comfort of our guests, smoking is not permitted inside any property. Smoking is only permitted outside. Cigarette butts should be extinguished and disposed of in ashtrays and/or designated areas. Our policy is strictly enforced, and there will be additional cleaning charges applied if evidence of smoking inside the home is found. A minimum fee of $500 will be charged for smoking inside a cabin. What items are prohibited at the cabins? Firearms, fireworks, and ATVs are strictly prohibited and are not permitted at any rental property. If evidence is found that guests have used these items on the property, the guest will be fined a minimum of $500 per instance depending on the circumstances. Guests will also be responsible for any damages resulting from the use of prohibited items. ATVs should not be parked or stored at the rental property. Do you offer concierge or guest services? We offer a variety of concierge, in-cabin, and guest services to help you make the most of your visit to Blue Ridge. We provide services like arranging grocery delivery, in-home chefs, fishing trips, romantic getaways, and more. Should you need anything before or during your stay, the SCCR team is available to help and can provide area recommendations for restaurants and attractions. We have established relationships with service providers throughout the area to offer you the best options. For your convenience, the cost of additional services can be added to your final invoice and charged to your credit card on file. Services can be arranged over the phone or on the SCCR website. Once your request has been made and your reservation confirmed, and/or the services rendered, all charges will be final and nonrefundable. We are not responsible for any misstatements by the guest including incorrect dates, times, or contact information. Excursions are reserved “as is” on the date and times requested by the guest. Third-party service providers will responsible for any liability, refunds, or gift certificates. SCCR will not be held be responsible for injuries, death, loss of personal items, or late arrival of guests to pre-reserved excursions. Will my mobile phone work at the cabin? Is there a landline phone? Mobile phone service is sporadic in the North Georgia mountains. Most of our cabins have mobile phone coverage. Verizon and AT&T seem to have the best overall coverage; however, some of our cabins have very limited service. Sprint and T-Mobile have limited coverage in the Blue Ridge mountain area. Most homes are equipped with a landline telephone which provides free local calls. Long-distance calls are not permitted. If you plan on making any long-distance calls, we recommend bringing a prepaid calling card or calling collect. Please call the SCCR team to verify phone usage at your vacation rental. What if I have a problem at the cabin? You will be given a 24/7 after-hours assistance number to call should you encounter an issue or have a non-life-threatening emergency during your stay. This number will be provided in your confirmation email or when you pick up your check-in packet. Guests should report any inoperative equipment or anything needing repair to the SCCR team as soon as possible. If the office is closed, guests may call the after-hours number for assistance. Non-emergency maintenance requests will be addressed during business hours. We cannot guarantee against mechanical systems failure during your stay, and every reasonable effort will be made to complete repairs quickly and efficiently. A member of our team or third-party staff may enter the cabin rental at any reasonable time to assess the situation or make repairs. If our team is unable to fix the issue, you may be moved to another rental property if deemed necessary, subject to availability. No refunds or rate adjustments will be issued. If maintenance is requested and equipment is found to be in working order, and the problem is due to guest oversight or user error, a minimum $50 fee will be charged. Am I automatically covered by the Damage Protection Waiver (DPW)? No, any damages to the property made during your stay must be reported to qualify for coverage. If any damage is discovered by our property care team after check-out, the DPW can be denied. Could SCCR team members enter my cabin to make repairs? A member of our team or third-party staff may enter your cabin rental at any reasonable time to assess guest maintenance issues or make repairs. A team member may also enter the property if required to conduct an inspection. With guest permission, real estate agents may visit the premises to show the cabin to qualified prospective purchasers. Do I need to take out the trash at the cabin? Trash must be bagged and placed in designated outdoor trash cans or bins at your cabin rental. All cigarette butts must be fully extinguished and included in bagged trash. If trash cans are full upon arrival, contact the SCCR team. If trash cans are filled beyond capacity during your stay, it is the guest’s responsibility to remove additional trash and dispose of it at a local reciprocal trash station. Advanced Disposal is located at 10169 Lakewood Hwy in Mineral Bluff, and at 2989 Old Hwy 5 in Blue Ridge. A $50 fee will be added to your final invoice for any loose trash left behind. If you or one of your guests accidentally leave something behind at your cabin rental, please contact us as soon as possible. If we find the item, we will make every effort to contact you and arrange to return it. During our busier seasons, it may take up to 14 days to return certain items. You will be charged a minimum packaging fee of $10 for items returned via USPS. Other shipping arrangements may be made using UPS, FedEx, or DHL. The fee to ship lost items can be charged to your credit card on file or another credit card. Are there grocery stores in the area? There are several grocery stores nearby. There is an Ingles market and a Food Lion located close to the SCCR office in Blue Ridge. Can I buy alcohol in the area? Fannin County was a dry county for many years. You can now purchase package beer and wine in Blue Ridge and most of the surrounding towns. Several restaurants in Blue Ridge serve beer, wine, and liquor. Liquor and spirits can be purchased in Ellijay, GA or Murphy, NC. Both cities are 20–45 minutes from our cabins. What activities are there in Blue Ridge, GA? There are a multitude of activities you can enjoy in Blue Ridge. Check out our Blue Ridge Guide for popular activities, attractions, and things to do in the North Georgia mountains. Visit the I Heart Blue Ridge blog for the latest festivals, events, and even more things to do. Our knowledgeable guest services team is also available to offer attraction and entertainment recommendations. For questions or assistance planning your vacation, call the SCCR team at 866.4CABINS or contact us online.